Dimensions 1 by 6.25 by 9.75 in. Compulsory ujamaa villages in Tanzania, collectivization in Russia, Le Corbusierâs urban planning theory realized in Brasilia, the Great Leap Forward in China, agricultural "modernization" in the Tropicsâthe twentieth century has been racked by grand utopian schemes that have inadvertently brought death and disruption to millions. Why do well-intentioned plans for improving the human condition go tragically awry? In this wide-ranging and original book, James C. Scott analyzes failed cases of large-scale authoritarian plans in a variety of fields. Centrally managed social plans misfire, Scott argues, when they impose schematic visions that do violence to complex interdependencies that are notâand cannotâbe fully understood. Further, the success of designs for social organization depends upon the recognition that local, practical knowledge is as important as formal, epistemic knowledge. 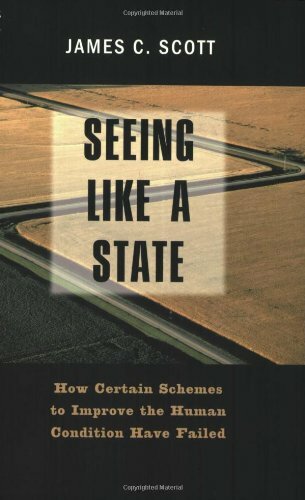 The author builds a persuasive case against "development theory" and imperialistic state planning that disregards the values, desires, and objections of its subjects. He identifies and discusses four conditions common to all planning disasters: administrative ordering of nature and society by the state; a "high-modernist ideology" that places confidence in the ability of science to improve every aspect of human life; a willingness to use authoritarian state power to effect large- scale interventions; and a prostrate civil society that cannot effectively resist such plans. About: Why have large-scale schemes to improve the human condition in the twentieth century so often gone awry? About: Compulsory ujamaa villages in Tanzania, collectivization in Russia, Le Corbusier’s urban planning theory realized in Brasilia, the Great Leap Forward in China, agricultural "modernization" in the Tropics―the twentieth century has been racked by grand utopian schemes that have inadvertently brought death and disruption to millions.